HomeBuying GuideWhat Guitar Accessories do Kids Need? You don’t need to get too fancy when you are buying accessories for a first guitar. Accessories that would be a good idea are a tuner, extra strings, a gig bag, a strap, and a guitar stand. If you are buying an electric guitar, you will also need to buy an amp. A couple of other things that might come in handy to a first-time guitar owner are a guitar stand, instruction book or DVD, and a metronome (to help keep a steady tempo). One important item that anyone who is learning guitar will need is a tuner. An electronic tuner is inexpensive, easy to use and one the most important things that you should have when you are starting out since beginners won’t be able to learn properly if the guitar is out of tune. 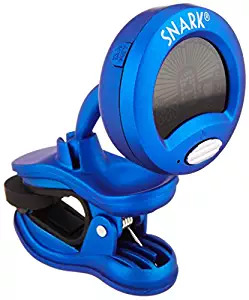 A cheap, great quality option that we recommend is the Snark SN1 Guitar Tuner. Strings can break like crazy, so make sure you have a decent amount of backup strings. For the most part, they are pretty cheap and easy to find. If you see them for a reasonable price, you may as well stock up or buy in bulk since there is a good chance your child will go through them if they get serious about playing. Guitar strings come in different gauges which refers to the weight of the string. They are also made of different materials depending on the type of guitar and the sound you are looking to get out of the instrument. For beginners, you generally just want to stick with the standard string setup from the manufacturer. I like D’Addario or Ernie Ball, but there are lots of great brands to choose from. 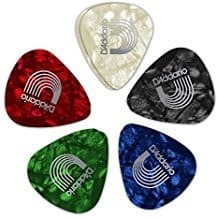 Unless your child is playing a classical (nylon) stringed guitar, it is a good idea to get some guitar picks. Some people only play with fingers and some who just play with picks. When you are learning, it’s handy to practice with both a pick and your fingers (not at the same time) and just kind of play around a little bit to see what you like best, although kids should primarily stick with a pick. Generally, a thinner pick is suitable for beginners, although some people believe that a thicker picks works best for children since they are easier to hold and maintain your grip. I don’t have strong opinions on what is best; I think it kind of depends on what feels comfortable to the child. What I do know is that you will want to buy a decent number of picks, as they tend to get lost very quickly. Fender or D’Addario are good brands to look for. In order to protect your child’s guitar, especially if they are taking to back and forth to lessons, you should invest in a guitar case or a gig bag. Hard cases offer the most protection, but they are heavy to carry, which doesn’t work that well for small kids. 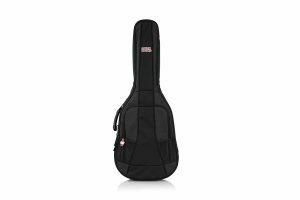 There are some great padded gig bags that are fantastic and do a fine job of keeping a guitar safe from dust and damage. Be aware that gig bags do vary quite a bit in terms of padding, thickness and quality. A lot of gig bags that come with guitars do not have enough padding to protect them from damage. You also need to make sure you buy the proper size of bag or case for the size of guitar that you have. If you would like to learn more on guitar cases, check out this post. 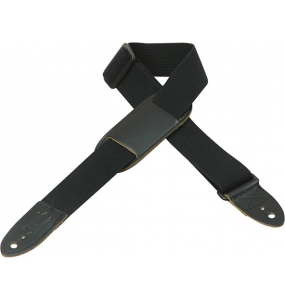 For those parents who are worried about their child dropping their guitar, a guitar strap is well worth considering. To use a strap you need to make sure the guitar you have has two strap buttons or pins on the body of the guitar. Classical guitars (and some acoustics) don’t usually have the strap buttons. If the guitar doesn’t have the pins they can be added, although this is a bit of a process so it isn’t something you will want to do yourself unless you know what you are doing (check your local music shop to see if they can do this for you). 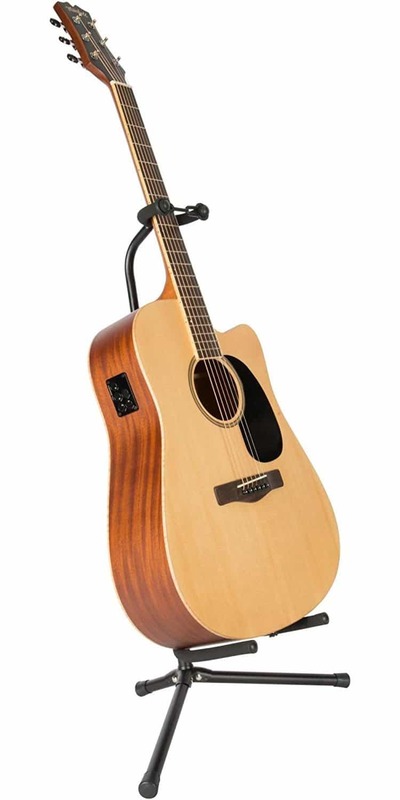 A nice to have accessory for anyone who owns a guitar is a guitar stand. A stand is a great way to store your guitar safely, while still having it out so your child will see it and will want to play. 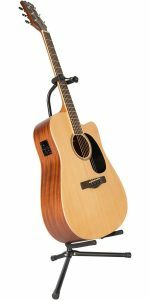 It is much easier to just grab the guitar off the stand rather than having to take it out of a bag or case. It isn’t a huge amount of effort to get a guitar out of a case, but some kids will use any excuse not to practice. You don’t need to spend much on a stand, something like this one should suffice. 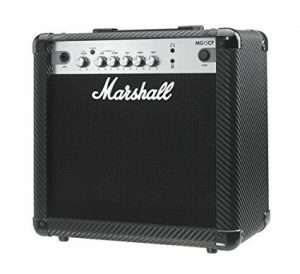 If you are buying an electric or an acoustic-electric, you will also need to get an amp. The thing about amps that you should be aware of as a parent who is buying a guitar for your child is that you don’t want to get the cheapest amp you can find. If you get a decent amp it helps to make the guitar sound better and helps to improve the overall guitar playing experience. You don’t need to get anything super fancy with different effects, just stick with a good quality basic amp. Fender, Marshall and Sawtooth have a couple of good quality, relatively inexpensive amps.